Hello, again. In case you missed either of the first two entries in this trilogy, about the lovely little offices of Squirrel and MacMahan Islands, please do head on over to Part I or II! As with Squirrel Island, there is scheduled ferry service between Bustins Island and the home of its 'parent' post office -- in this case South Freeport, Maine. 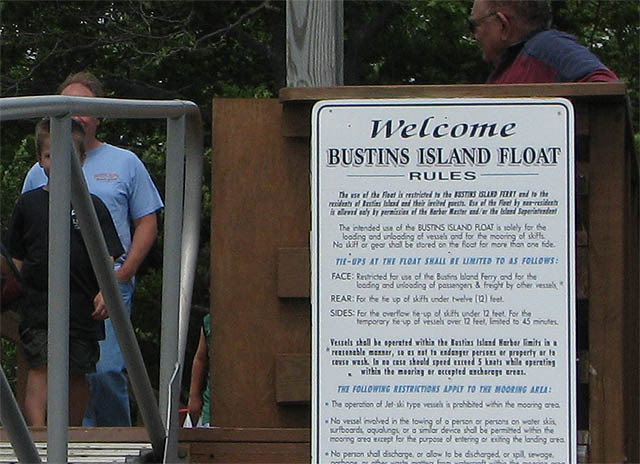 The $10 trip takes about half an hour, with about a 10-minute layover on Bustins Island. The ferry we happened to take was also the mail ferry! We accompanied the official contractor with his daily bin of mail over to the CPO, which was quite photogenic. 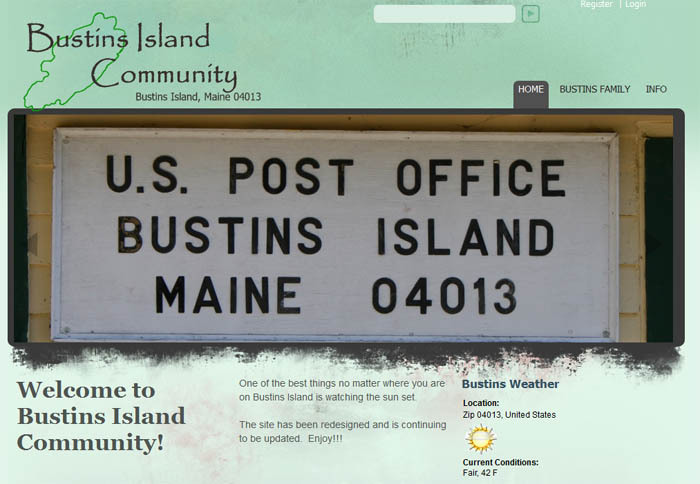 Let me also note that Bustins Island is yet another community that takes pride in its post office. Here's a screenshot from the community's homepage; other images include the school and pleasant landscapes. You can once again see that this is where the community comes for information. There's building also houses community bulletin boards as well as the town's public library. A woman was reading in there while the postal tourists explored the post office. While buildings might subscribe to a numbered address system for the ease of newcomers, all mail delivered to Bustins Island residents is done through General Delivery: As an index card below the window notes, the address for all residents on the island is: [Your name] // General Delivery // Bustins Island, ME 04015-9999. You have to pick up your mail at the window during business hours (which are presently 9:30 - 12:30 Monday through Saturday). The island has possessed a post office since 1897, though until 1908 it was known as Seeket. The office was independent [that is, headed by a U.S. Postmaster] until 1967, since which it has been a rural station / CPO under the parent office of South Freeport. It should be noted that these three are only open during the summer months, because there are few, if any, year round residents. All the other offshore island post offices in Maine serve permanent communities, though some do have substantial summer populations as well.